Brilliant book! Brilliant concept and if you are a fan of his other books then this is a ‘must read’! 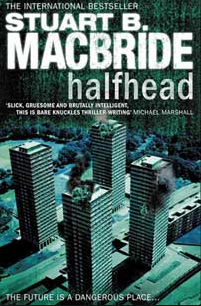 In fact, as this book is not part of a series, but is a ‘stand alone’ book you can feel free to read and enjoy whether you’ve read any of Mr MacBride’s other books or not. And if you really haven’t read any of his other books then you need to find yourself a copy of the sensational Cold Granite and get acquainted with Ds Logan McRae. Halfhead offers a scary view into the future of our world. I really enjoyed the escapism created by the story being set in the future, yet not so far into the future that it was unimaginable. It’s the very concept that this monstrous way of living isn’t too much of a stretch of the imagination that makes it so great. It is easy – and scary – to believe that the world could head that way. As always, in my opinion, with Stuart MacBride’s books, the characterisation is superb; the Dr Fiona Westfield character is just fantastic. Despite her being a sick, perverse serial killer you end up feeling such empathy for her wanting her life back. Very engaging, fast paced and an all round great read.